We have received a number of emails from people having difficulty commenting on the blog. We want to encourage comments, so I have changed a setting that will make commenting simpler. From now on, you don't need to sign in to leave a comment. Please select Name/URL and leave your name. Please do NOT leave anonymous comments. However, please DO NOT leave anonymous comments because we love to know who you are and respond to you. 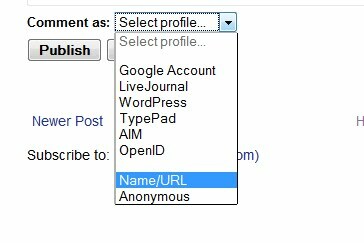 Instead, choose "Name/URL" from the list and enter in your name. You can leave the URL line blank. If you had trouble in the past leaving comments, you can try leaving a comment on this post to see how it works for you now. If you still have trouble, please email me and I will try to troubleshoot further. P.S. Sometimes when anonymous comments are permitted, a blog can start accumulating a lot of spam comments from advertisers. If that does start to happen, we will have to turn this setting off. Hopefully this won't happen and everyone can keep commenting by entering just their name! Now it's easier to leave comments. Hope to hear from you!